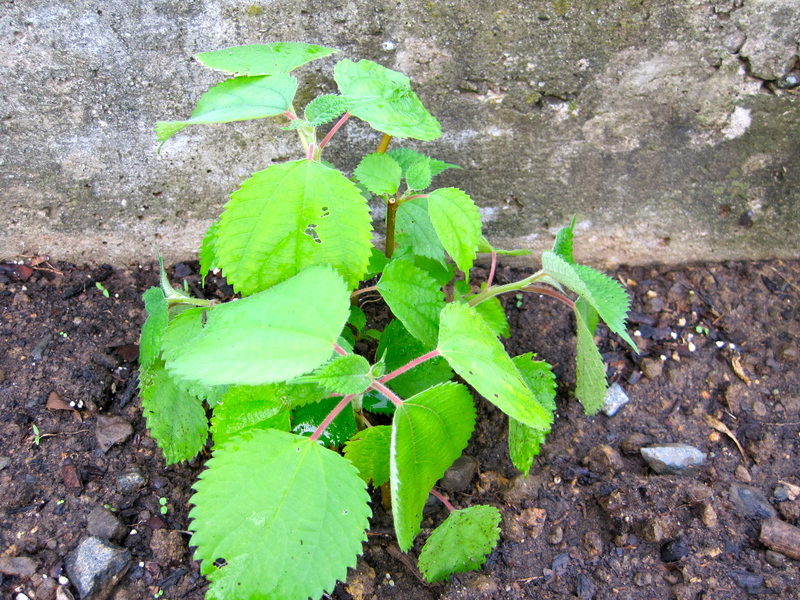 This summer I planted a few ramie plants in the hopes of being able to harvest some ramie fiber next year. 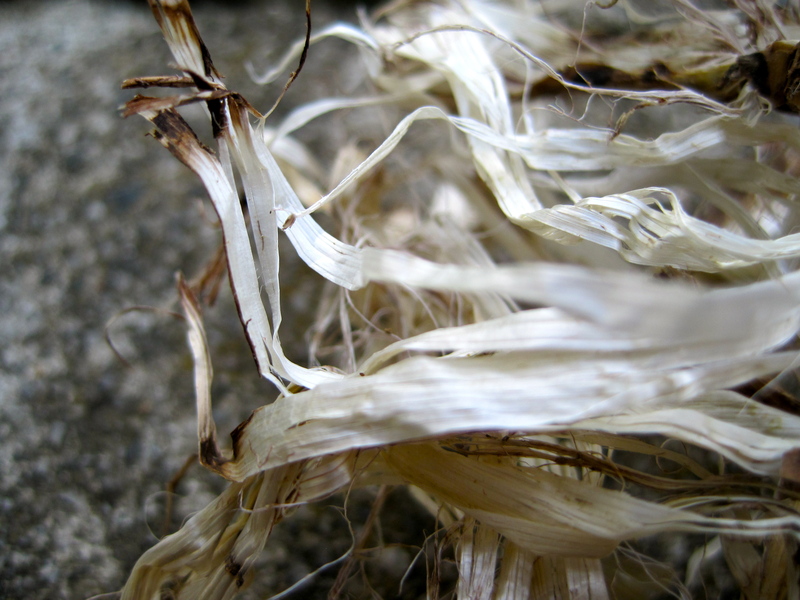 Ramie is a member of the nettle family and has been used throughout Asia to create a beautiful and strong fabric similar to linen or hemp. Over the last month I have been trying to get better at taking fiber from kudzu vines. This was my last attempt and I’m pleased with the results. 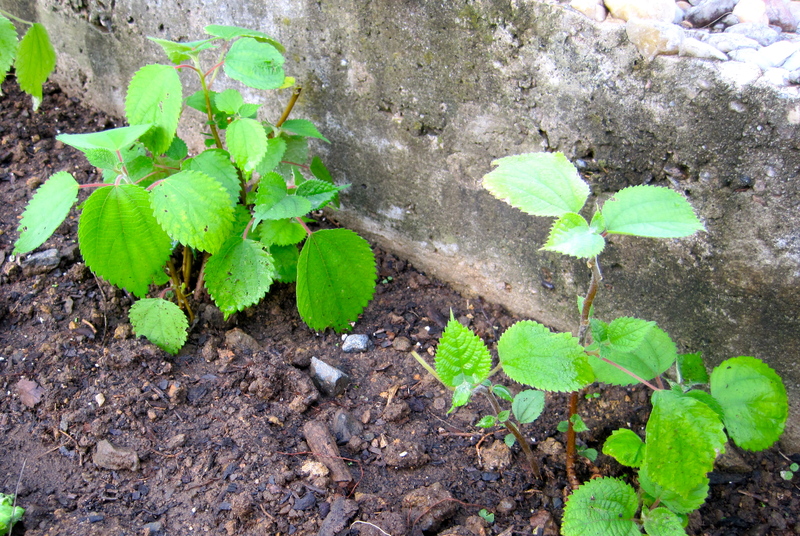 I gathered the vines from the forest floor where it was easy for me to find vines that were straight and were growing with almost no leaves. I boiled the vines for one hour and then allowed them to rot under a piece of old roofing tin for about 4 or 5 days before stripping the fiber from the vines and washing it with warm water and castile soap. 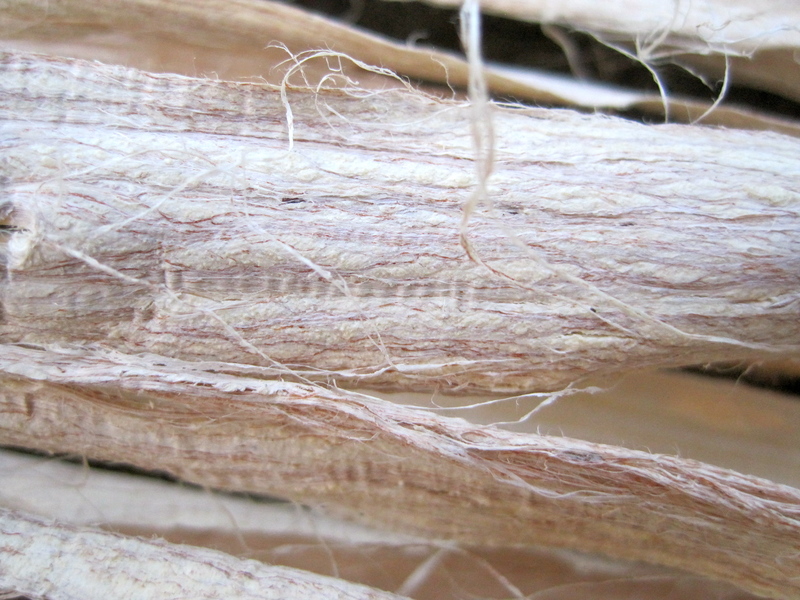 The fiber is a very light golden color and the remaining bark is easily removed. 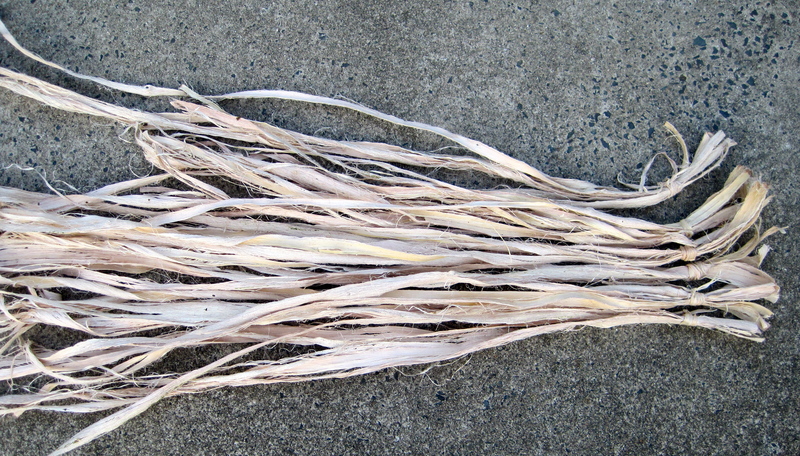 I recently taught a class in Richmond, VA about making thread from wisteria and kudzu fibers. Here are some photos of my preparations. 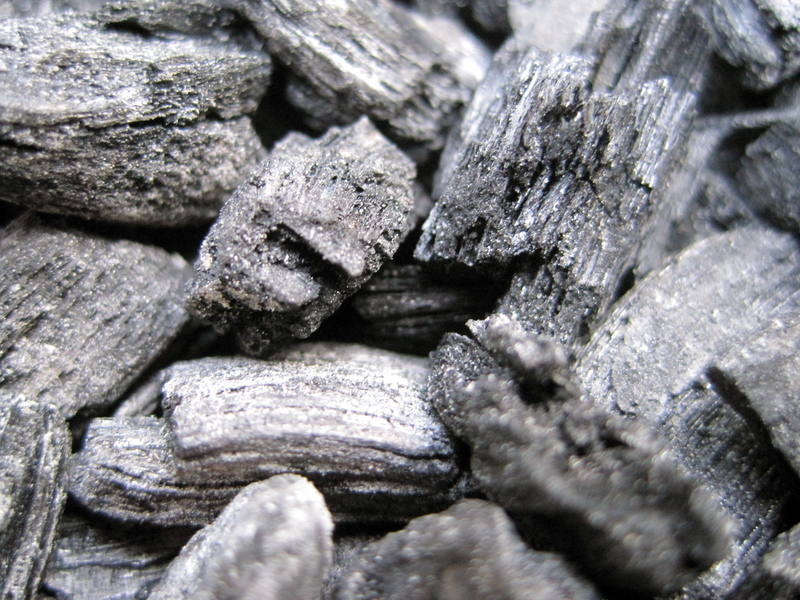 Wisteria bark fiber and hardwood ash. I recently found this very worn zanshi fabric. 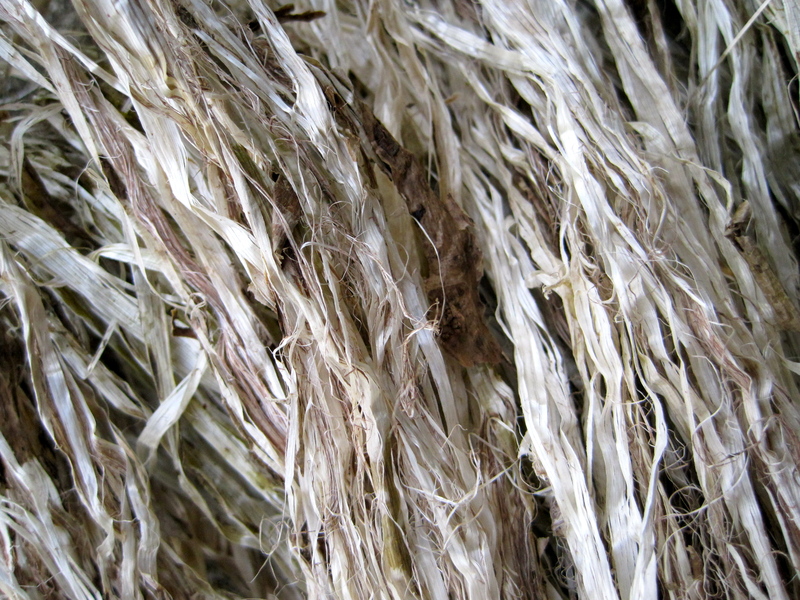 The warp is hemp and the weft is cotton and hemp. 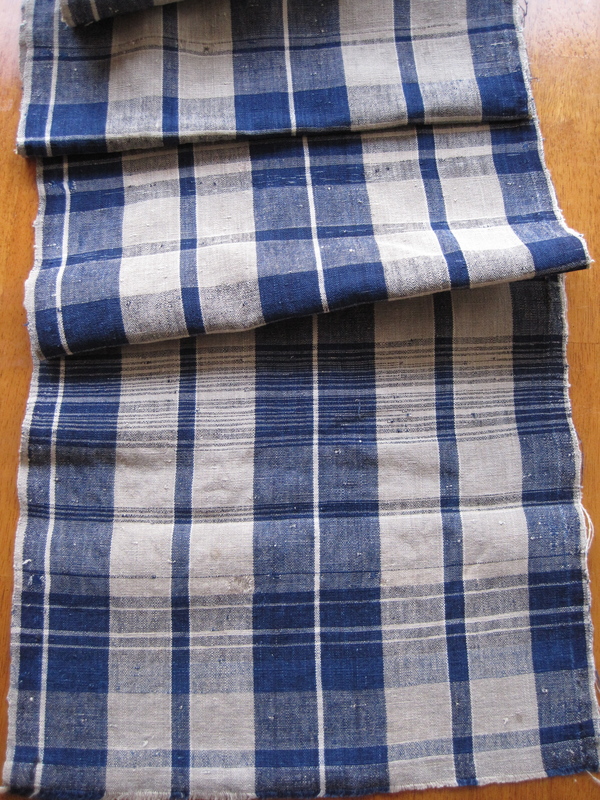 It has a beautiful worn feel simular to antique linen. 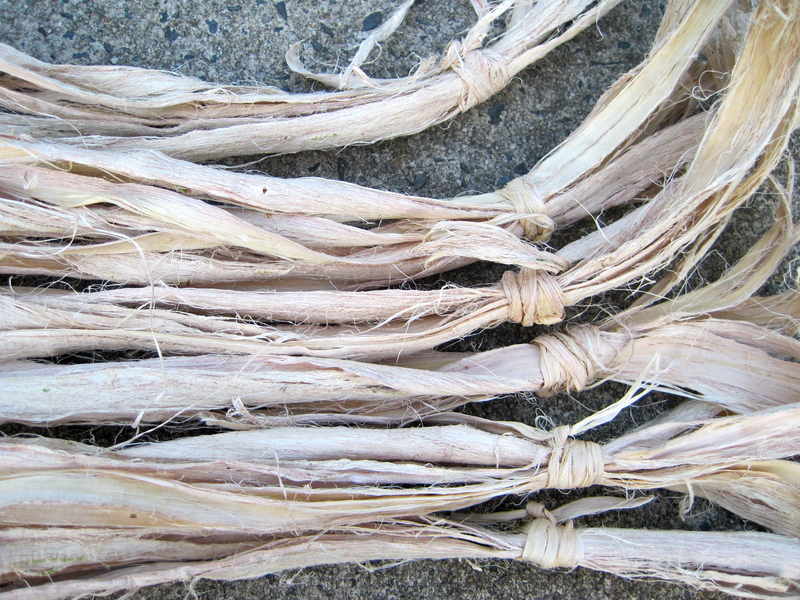 It has been dyed with indigo, but the natural color variations in the hemp thread also lend to the design. 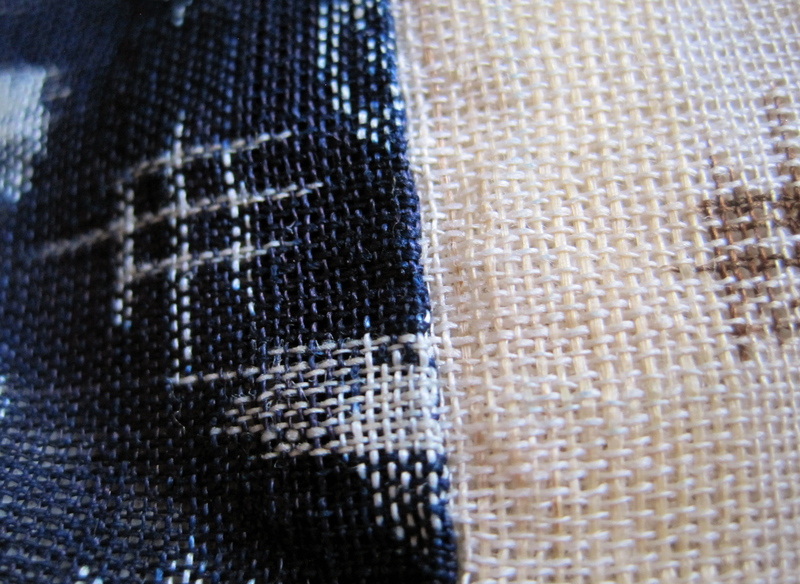 Zanshiori is fabric that has been woven using the threads left over at the ends of numerous bobbins. due to the use of thread fragments the fabric has a random pattern and a varied texture because of the knots used to bind all the threads in the weft together. 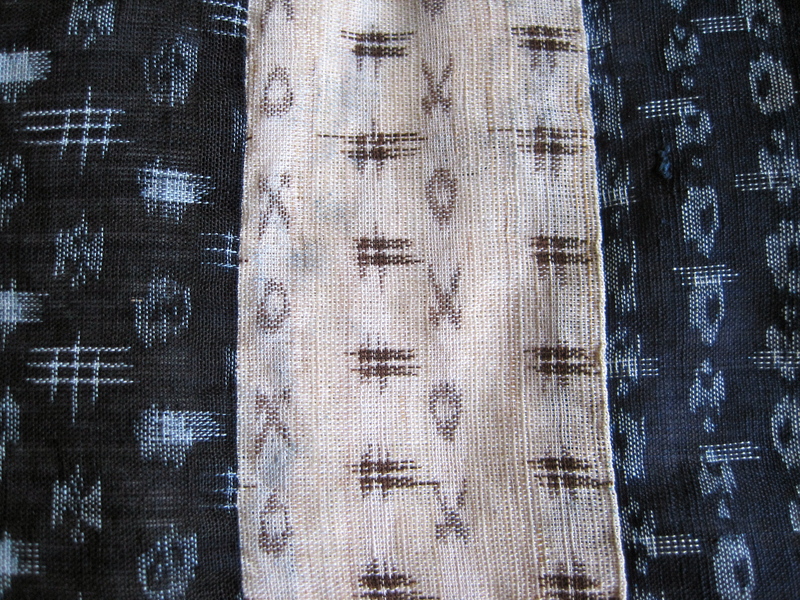 Zanshi was often woven at the end of a bolt of fabric to make use of any remaining warp. 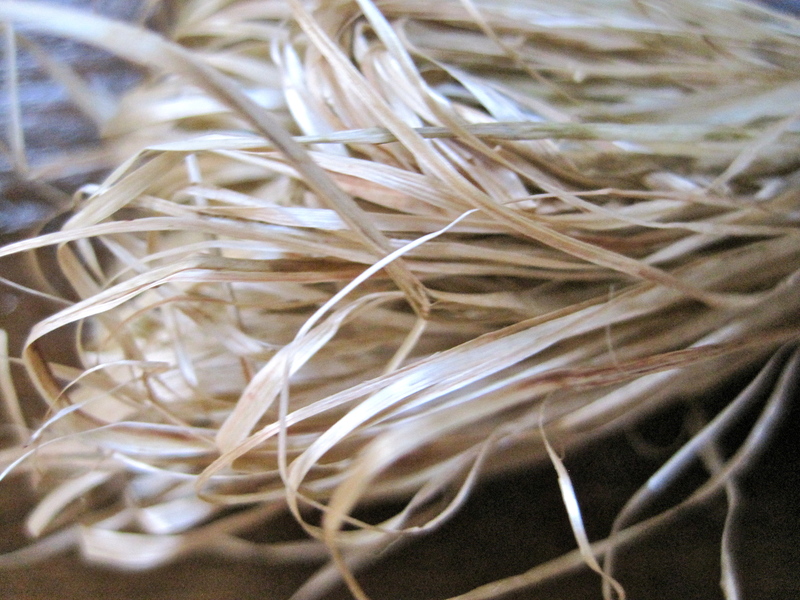 This is fiber taken from the kudzu vine. Here in the South kudzu is an invasive plant that can take over entire tracts of land in a season or two. Despite being an invasive weed it is a beautiful lush green against the sometimes dry and burnt colors of late summer. Kudzu flowers give off a thick sweet scent, vines can be woven into baskets, and the fiber from the vines can be woven into fabric. 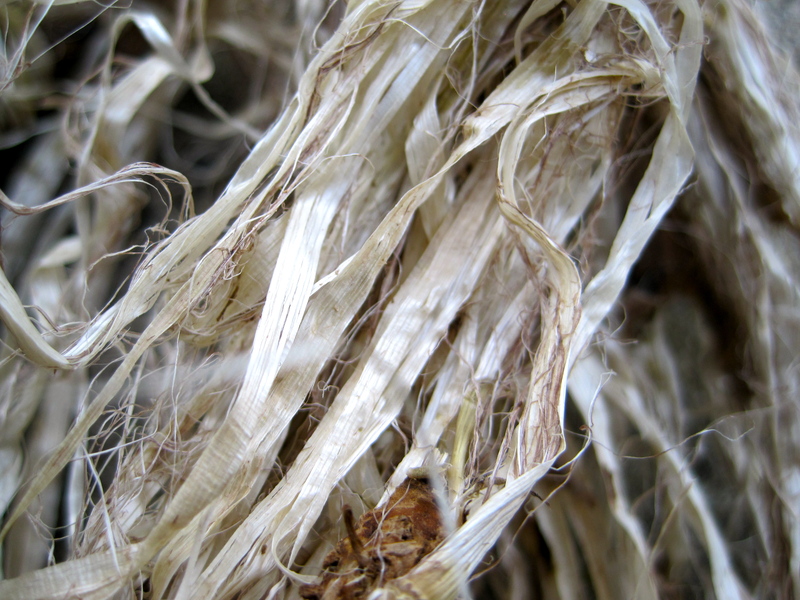 I took this kudzu fiber back in the fall last year. 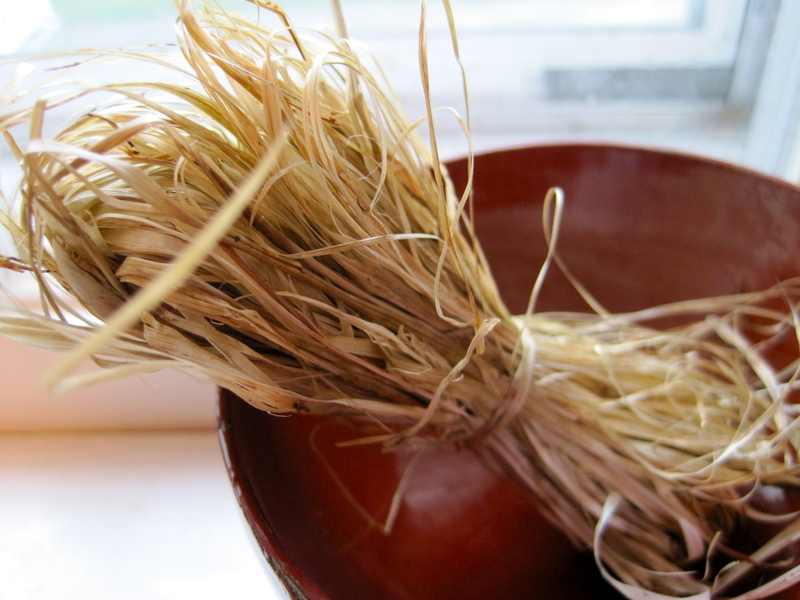 It is a delicate fiber that has a glossy sheen which I think was part of the reason it was such a desirable fiber for clothing of the upper classes in old Japan. I have it resting here in an Edo era lacquer ware bowl. 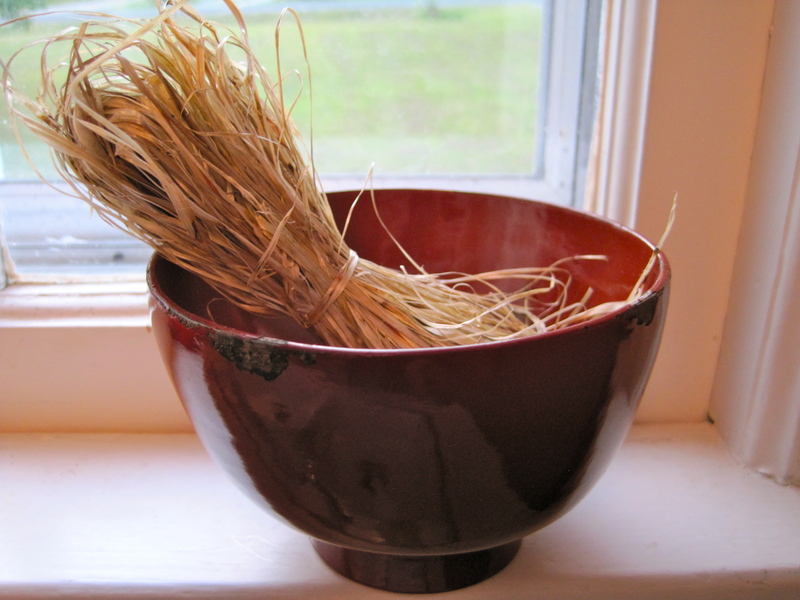 The bowl has a beautiful uneven shape and thick deep red lacquer. I imagine that it was made by a rural lacquer maker as it has a strong rustic handmade feel rather than the delicateness of a more refined city made bowl. There is a long process of taking kudfu fiber from the vines. Vines are gathered and bound then boiled for about an hour. The bound and boiled rolls of kudzu vines are then left outside to ret under leaves or grasses for a few days. When a powdery white mold appears on the vines and they are slimy to the touch the inner vines can be stripped from the outer fiber. 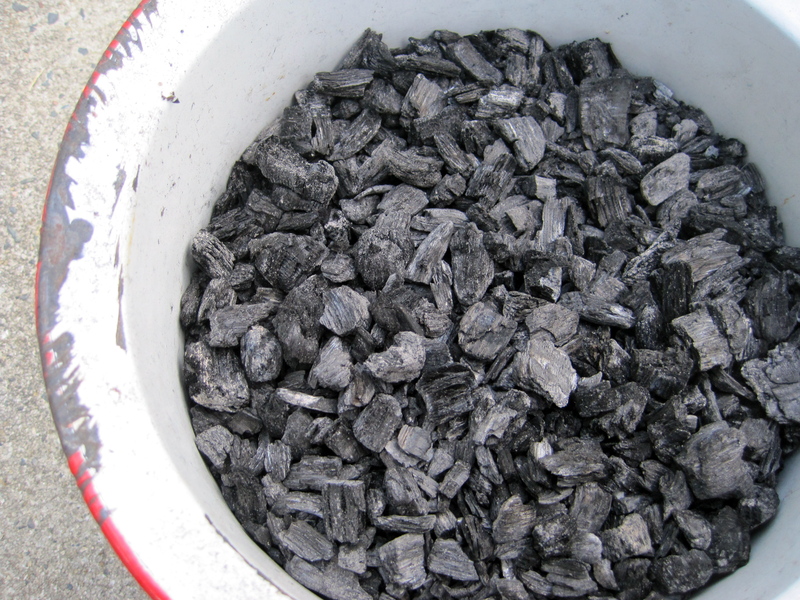 Then the fiber can be washed and scraped to remove the slimy outer coat. 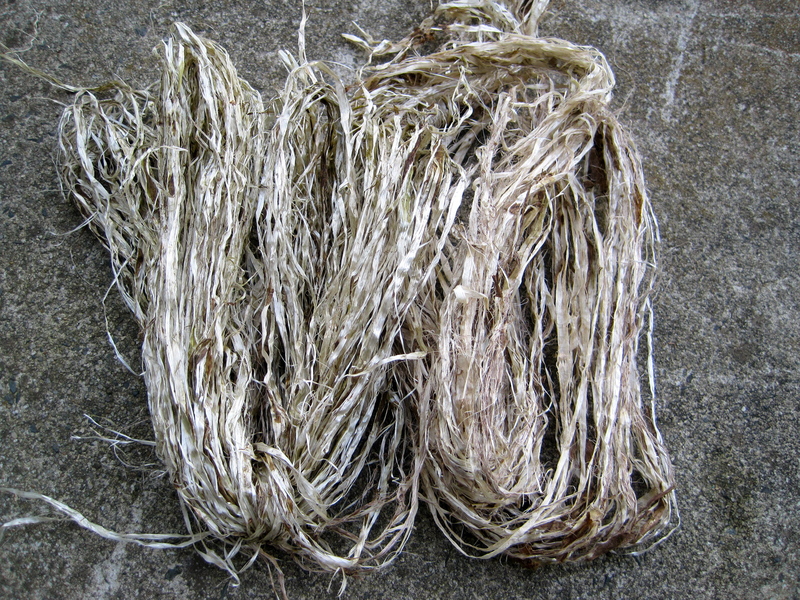 I have only attempted to make kudzu thread but this site http://www.ryukyutextile.com/kasuri/Weavers_studio_4.html is a great visual guide for processing kudzu fiber.